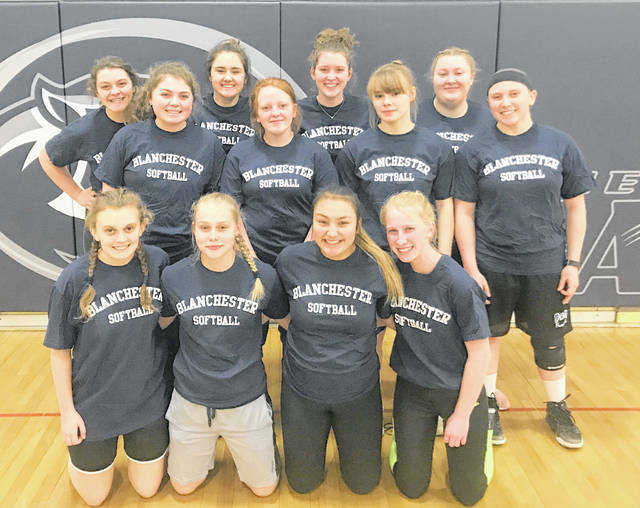 The Blanchester High School softball team, from left to right, front row, Savanna Shank, Lana Roy, Noelani Tangonan, Rianna Mueller; middle row, Kelsey Naylor, Maggie Caldwell, Elecia Patton, Kassidy Abney; back row, Marissa Jacobs, Madison Creager, Zoie Stanforth, Chloe Stewart. Blanchester softball coach Jamey Grogg lists nine newcomers of note for this season’s Ladycats roster. He’ll need ‘em. Blanchester lost eight players from last year’s 8-12 team that finished fourth in the very tough SBAAC National Division. “Even though we have quite a few girls who lack varsity experience, I am thankful that I have three outstanding seniors – Kassidy Abney, Elecia Patton and Savanna Shank – to help lead this team,” said Grogg, who enters his 16th season as BHS head coach. Abney and Patton are four-year starters for BHS – Abney hit .514 last season. Abney’s first homerun this season will make her the school’s all-time career leader. She currently has 14 homers. The main holes to fill come with the absence of Madison Curless, a horse in the circle the past four years for BHS. She is first in school history in innings pitched (485.3), ninth in strikeouts (300) and second on offense with 11 homeruns. Jay Dalton also graduated and is fifth all-time with seven homeruns. Grogg said other coaches in the program are Tom Lee, Matt Sexton, Joey Freeman, Makayla Shank and Dan Peters. Though youth and inexperience must be overcome, the more likely downfall of the BHS squad will be if “we don’t show up every day with a good attitude and ready to give our best effort,” said Grogg. https://www.wnewsj.com/wp-content/uploads/sites/22/2019/03/web1_SFT_blanteam.jpgThe Blanchester High School softball team, from left to right, front row, Savanna Shank, Lana Roy, Noelani Tangonan, Rianna Mueller; middle row, Kelsey Naylor, Maggie Caldwell, Elecia Patton, Kassidy Abney; back row, Marissa Jacobs, Madison Creager, Zoie Stanforth, Chloe Stewart.